“Organic obstacles abound,”the driver smiled and pulled onto the wrong side of the road to avoid a large leaving of road apples from Amish transport. 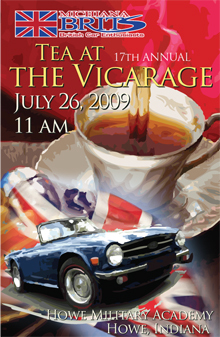 The event was Tea at the Vicarage, Michiana Brits’rally through Lagrange County, Indiana, on Sunday, 26 July. This 2009 edition may have been the best route yet in the 17-year history of the event. Along the way, several immaculate farmyards were crowded with unhitched buggies as the Amish worshipped in one home or another. Their horses browsed in adjacent fields. Rallymaster Roger Deacon’s “Tea” squirmed 22 sports cars through charming country and small town scenes. Amish children waved and rally folks waved back. And an errant herd of goats held up a halfdozen two-seaters anxious to get on with the event, a photo was snapped below:. Roger had questions to be answered along the 55.4-mile route. Some queries had obvious answers, some did not. Most were arguable, but as Roger pointed out before and afterward: he asked the questions...only he had the correct answers. After the rally there was a BYO picnic at the launch and return site: the 1884 Howe Mansion on the 100- acre grounds of co-ed Howe Military School. (The school has 175 students; 97% go on to higher education.) Howe, the tiny northern Indiana community, was once known as Lima, and before that by the Potawatami name, Mongoquinong. During the BYO picnic, Roger and Michiana Brits helpers tallied mileage, Peoples’ Choice voting and answers to rally questions. Peoples’Choice - Dan and Annette Craft in their 1968 MGB/GT. “Happiness is Ice Cream”winners - Rich Johnson and Lee Moore, South Bend, IN. i.e. lowest score nets six tickets for free ice cream donated by the Happiness is Ice Cream shop in Howe. Driver Allan Cope and his passenger Jack Osmun probably had heard or read about being stopped by a herd of livestock, but such things don’t happen on a US road in the 21st century. But it did during Michiana Brits’Tea at the Vicarage rally through Amish country on 26 July. 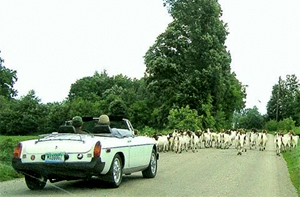 Allan eventually oozed his MGB around the goat herd and continued on the Lagrange County, IN, rally route. The fugitive herd stopped about a half dozen rally cars. An Amish family later shooed the goats back into a field.